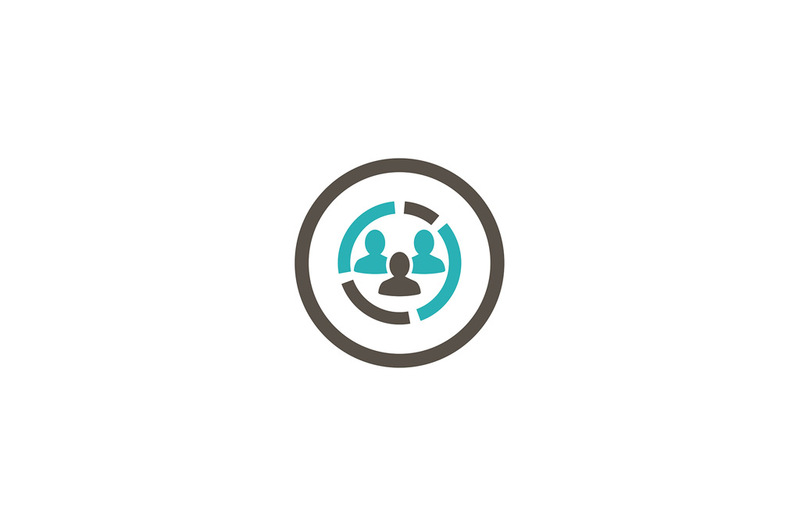 We know that different social platforms tend to attract certain identifiable types of people, just like other kinds of media; however, not everyone uses every social media outlet. In an effort to understand how social media platforms (Facebook, LinkedIn) work, try comparing them to older mass media networks (television). Facebook is like the CBS Network and their individual pages are like their television shows. Sure, they have millions and millions of more shows, but the principal remains the same. Pinterest, Twitter, and Instagram are like networks too, but are smaller, less watched networks. LinkedIn is a bit of a different beast; with its unique audience, it’s less of a CBS network, and more like an ESPN or A&E. Facebook is far and away the most used social media platform. 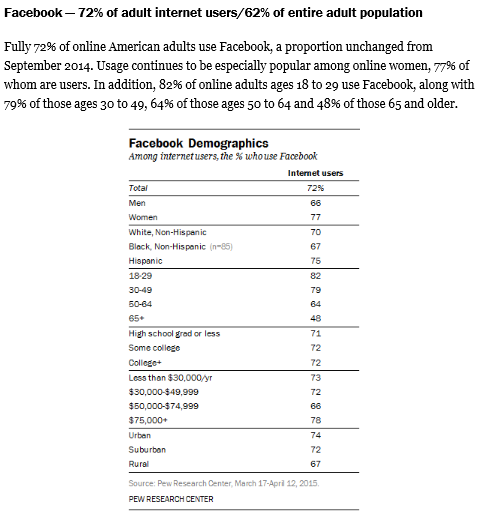 In 2014, Pew Research Center found that 71% of online Americans use Facebook. Their closest competition is a tie between Pinterest and LinkedIn, both at 28%. Facebook has users of all ages, ethnicity, and income levels, while the remaining platforms definitely have certain audiences that prefer them. The following tables come from the Pew Research Center. There are several key takeaways. The adoption of Facebook by persons 50+ is of particular note. There is no other social media that has been able to attract that group like Facebook has. The almost universal acceptance by persons of all ethnicities is also of note. 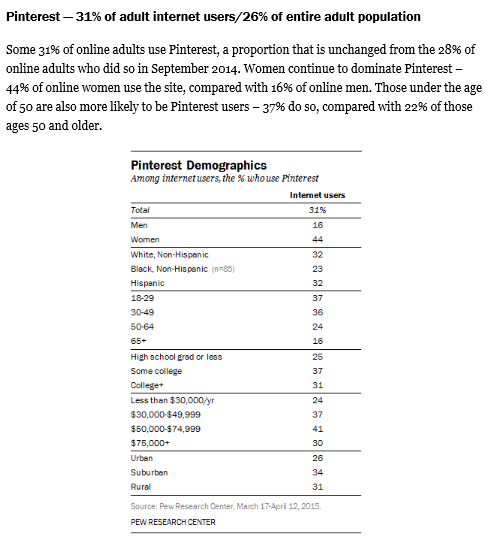 Pinterest is second in percent of users at 31%. This is about a 10% increase from 2014, when they averaged 28% of adults according to the Pew Research Center. 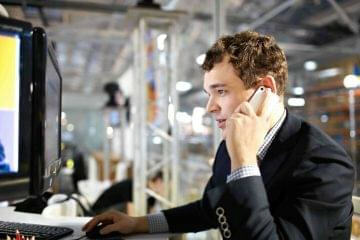 They are dominated by female usage, as well as winning with younger audiences. Instagram is used primarily by younger people. In fact, look at the age breakdown. 53% of persons (internet users) 18-29 use Instagram, but that drops by more than half among persons 30-49, to only 25%. 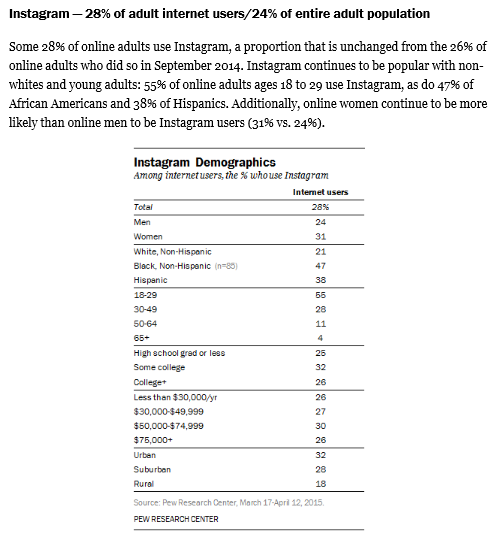 Instagram has also been adopted by black persons in greater numbers than whites or Hispanics. 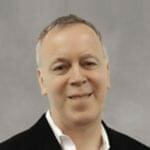 LinkedIn is next in our review and really stands alone among social media platforms. 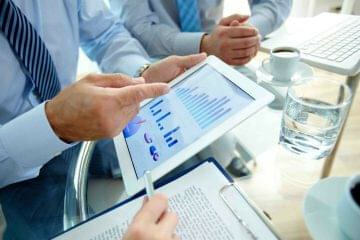 In fact, it’s much more of a professional platform than a social media platform as we know it. You don’t post vacation pics or cat videos on LinkedIn, but you do look for career opportunities, network with other professionals, send business-related messages, and other similar interactions. Twitter surprisingly has the lowest usage rate. It’s used by men more than women, and by far by younger persons rather than older. There is also a larger urban audience by percentage, than several of the other platforms. How do you use these numbers? You won’t just target 18-29 year olds on a social media platform, then buy a bunch of impressions aimed at them. 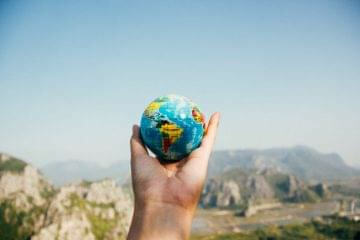 In today’s marketing savvy world with its abundance of data, we’re able to target geographically, by income level, education, and so much more. So, let’s say your target market is women aged 25-49. They are of all ethnicities, but generally have not gone to college and tend to live in urban areas. Where are you most likely to find them? 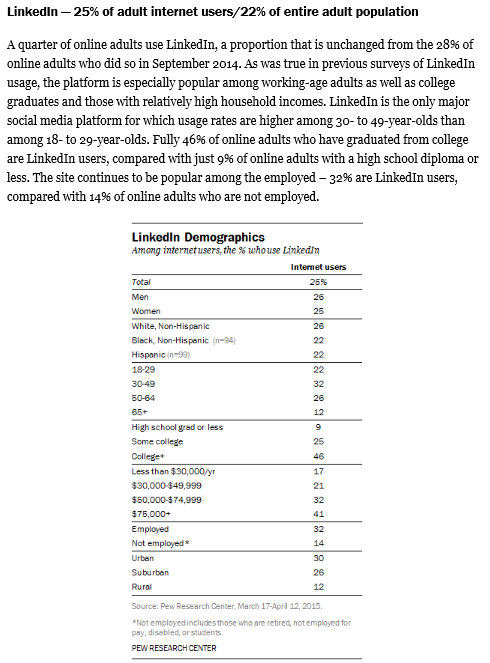 You can find these audiences on most of the social media platforms, except for LinkedIn, which as pointed out, has a rather more unique and narrow focus. The question then comes down to which social media might offer the best first option for this market. It’s also important to note that we are not discussing price. That’s, of course, a major factor, but for the sake of this article, we’re assuming that all costs are relative. You can certainly be able to find these audiences on Facebook, but how about the other platforms? Pinterest: There is a strong use by our age demographic, but it’s not used in great numbers by our education and home location demographic. Instagram: The Instagram audience is young. We will have a tough time finding 30-49 year-olds here. Twitter: This could be a match. 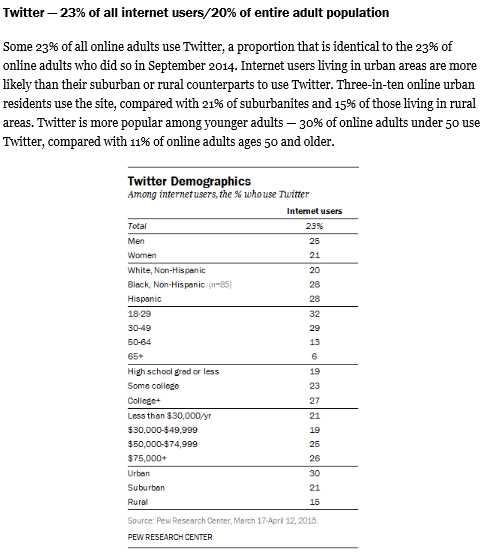 There is good usage by the age demographic and many Twitter users are urban. The average Twitter user is more educated than our target, but we could still find our demo in strong enough numbers to warrant a closer look. It’s at this point, that cost, platform usage, mobile importance and more will come into play. The ability to geographically target within parameters as tight as two miles, is a great benefit of digital advertising; radio and television cannot achieve this. If you’re trying to drive local traffic to a retail location, digital ads can eliminate a lot of wasteful spending. In order to reach this target market, you would consider Facebook, Instagram, and Pinterest. There are other factors you would consider such as time spent on the platform and how it performs on mobile if that is important to you. It’s also important to note that you will more than likely you would buy a group of websites that reach your target market rather than simply buying one single platform. I’s important to know that each platform is preferred by slightly different markets and that each platform is used in a different way.